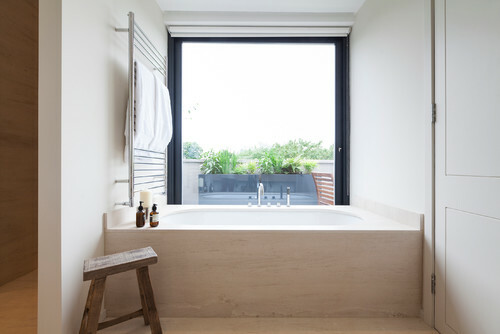 Every bathroom should have a window for ventilation and natural light. Generally, bathroom windows are frosted or textured for privacy, but if you have chosen a clear window in the bathroom, you will need a window covering. 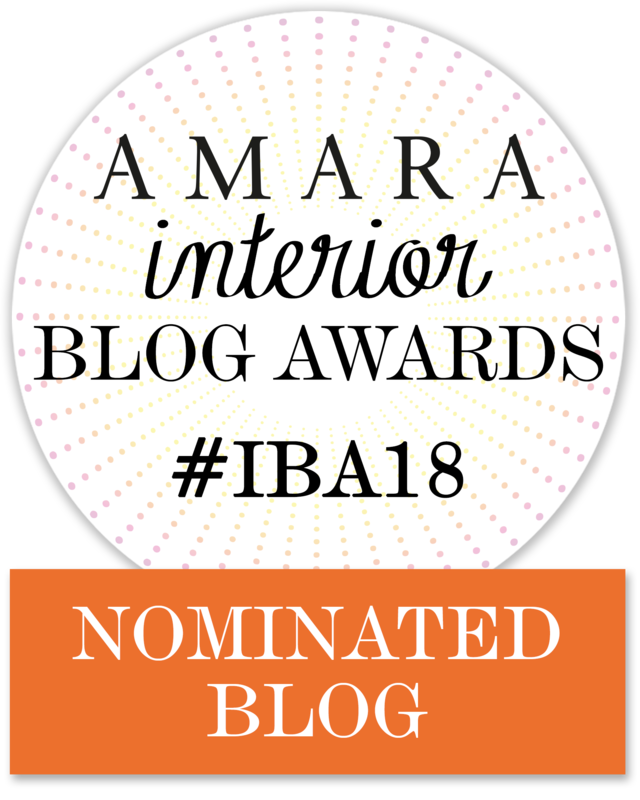 But what are the best window coverings for bathrooms? 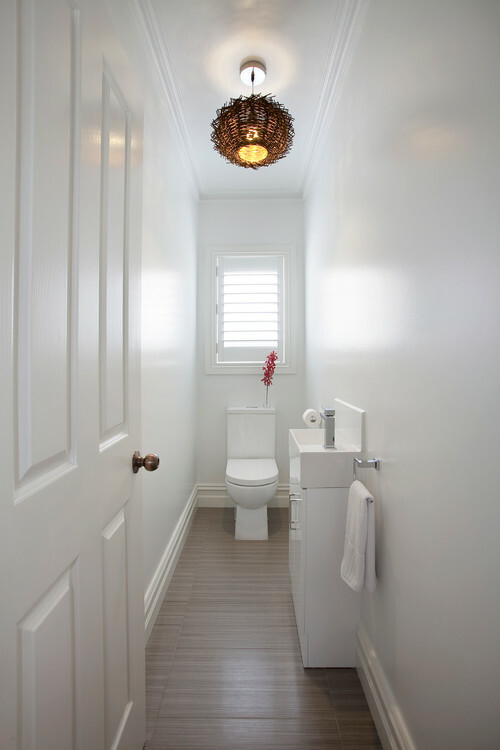 It’s important to choose a window covering that will allow enough light and air to stream through, yet offer privacy when the bathroom is in use. The bathroom can become a humid environment and this can prompt mould and mildew to grow so your window covering should also be waterproof. 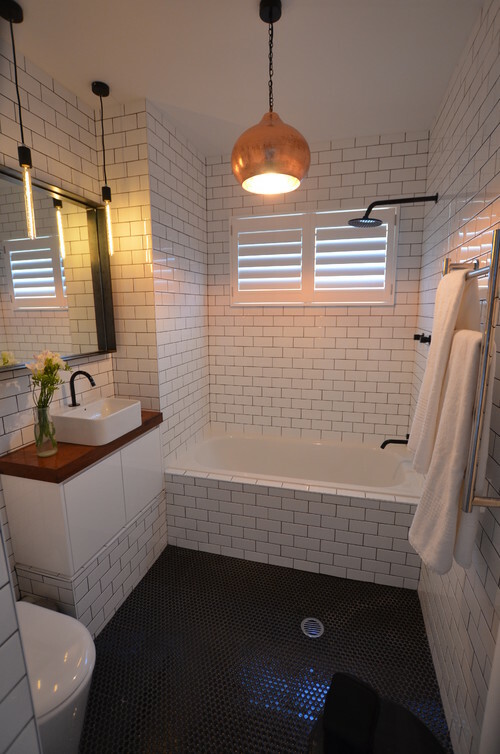 I reached out to Trent from QLD Custom Shutters, who has been in the business of window furnishings for more than a decade, to ask which are the best window coverings for bathrooms. 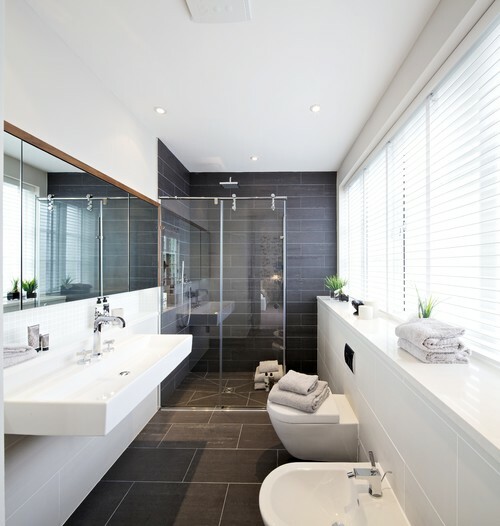 Trent advises the PVC or Aluminium Shutter is the best window covering for the bathroom. They meet the three main factors of light control, airflow and privacy. 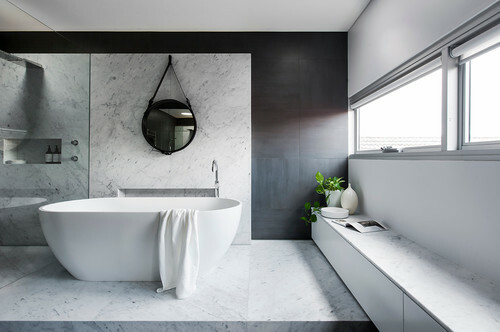 It can be hard for the consumer to distinguish between a timber, PVC and aluminum shutter but it’s vitally important to choose the right material for the bathroom due to moisture. 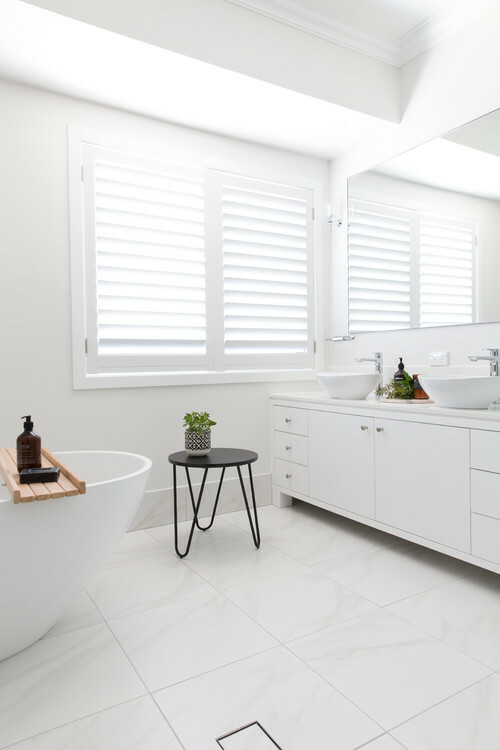 Aluminium shutters are generally used externally around the home and people disregard these for indoor use, but they are a viable solution indoors – especially in bathrooms. Their finish can look just as good as Timber or PVC. Aluminium shutters can be more expensive than PVC and timber, however it will outlast all the bathroom window coverings as it won’t corrode, discolour or buckle from moisture. The only maintenance required is a wipe down with a microfibre cloth and your cleaning is done. Aluminium shutters can come customized in a variety of colours, but the most popular colour choice is white. If your window is next to the shower or bath and is prone to get wet, an aluminium shutter will be your best choice. PVC shutters are more cost effective than aluminium. These can come in a customized colour, however the most popular colour is white. PVC shutters won’t rot or swell as they are basically waterproof. But it’s important to check your PVC shutters have aluminium inserts in the blades, stiles and frames to add structural strength. 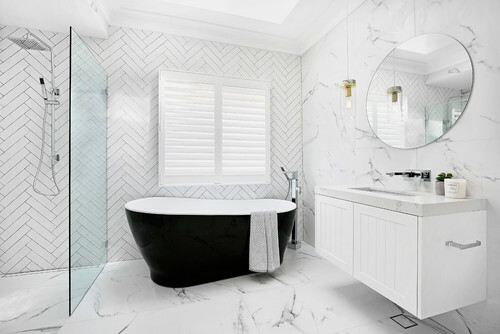 PVC shutters without the aluminium blade are prone to distortion and can bend and twist, which is not an ideal look for your bathroom, let alone not value for money. PVC shutters suit smaller bathroom windows and the toilet window. If you love the shutter look and can’t afford aluminium, then PVC may be the way for you to go. Just check the structure of your PVC shutter as not all PVC shutters are the same. Roller blinds can be another option as a bathroom window covering. The benefits of a roller blind are they offer privacy, UV protection, easy to roll up and down and can come in a water-resistant material. Roller blinds can offer a minimalistic look as the blind is installed within the window frame. The cons to roller blinds are the water-proof fabric can harbor dust (I know this from experience! ), they can bang against the window if the window is open (also know this from experience!) and they can shut off air flow and light, which can make your bathroom look dark. The lighter colour versions may not offer privacy at night. Lack of air flow can prompt mould and mildew growth, which is what you want to avoid in your bathroom. However they can be an economical up front solution. A venetian or vertical blind can be installed in the bathroom, but they aren’t the most practical option. The small slats and cords can blow around when the window is open. If you do choose this option, choose PVC Venetian blinds instead of timber as the timber won’t last in moisture. Vertical blinds are economical, resistant to UV rays and moisture. They have an older aesthetic though and aren’t a popular choice for the bathroom. Shutters are by far the most popular window covering for the bathroom as it covers the three factors which are required in every home window and door. What window covering did you choose for your bathroom? Which window covering is your favourite?